The age of Edwardian Style was ushered in with a new king, King Edward VII, after the reign of Queen Victoria, which offered a brief period of architectural and interior design style as the King only reigned for a short time period. However, in that time period in which a ruler changed the perspective of his subjects there were definitive style changes to building exteriors and interiors that created a specific Edwardian style. This article can help you restore your Edwardian home to its previous grandeur by focusing on the specific interior and exterior features that defined Edwardian style. With the Edwardian style, there was a fresh change that did away with the Victorian heaviness, darkness, and clutter and replaced it with something clean, bright, and light. The interior style was heavily influenced by Queen Anne and arts and crafts movement so everything became less formal – from colours to wall coverings to furniture. There was also a hint of the feminine to the interior style of an Edwardian home, including pastels, floral patterns, wicker and bamboo furnishings, and chintz and damask upholstery. These pastel colours included primrose yellow, lilac, gray and leaf green mixed with cream walls and slightly darker colours for the upholstery. The floors were simple with polished floorboards in light wood stains accented with oriental rugs. Fireplaces were scaled back into smaller versions with decorative tiles and copper hoods while electric lighting started to illuminate these interiors. Heavy draperies were also replaced with lacy, plain, or floral curtains or even roller blinds. To complete an Edwardian style interior, you can add needlepoint cushions, pictures on hooks widely spaced, and accessories like Royal Worcester china, a gramophone, Tiffany lamps, Lalique glassware and silver photograph frames. Fresh flowers that mirror those on wallpaper or upholstery complete the interior design of an Edwardian home. The same simplification process and lightening up continued on the exterior of homes within those defined by Edwardian style. Gone were elaborate and over-embellished exteriors that often also were characterised by an eclectic mix of features. Instead, the Edwardian exterior style offered many of the touches found in classical design but used more modern construction practices and materials, including steel or reinforced concrete frames. Urbane exterior Edwardian homes often used a concrete casement with a brick-faced facade whilst country homes retained a Mock Tudor style with leaded windows. 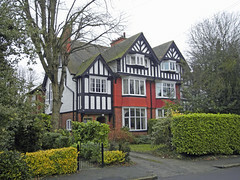 Other middle-class homes of the Edwardian period mixed muted versions of other styles like the arts and crafts movement as well as art nouveau and Japanese features. To complete an Edwardian look to a home, it is best to select a door design that focuses on a simple elegance with minimal mouldings and an overall lighter look. To add light to the home, select an Edwardian door that has a stained glass or clear textured glass insert. To see some examples of Edwardian doors that can work for your home, please visit our gallery here. We can provide you with bespoke Edwardian doors with stained glass inserts made to your specifications. Our quality, handmade Edwardian front doors will finish off any restoration project and look great in your home. Our handmade stained glass panels, made to order. Images courtesy of: D.H. Wright on Flickr and The Public Domain.